It was only an old book that the professor found while traveling by train through Scotland. A scholar of medieval history, Professor George Smith was on sabbatical studying Scottish legends and myths when he chanced to meet an aged Scotsman and his granddaughter on their way to her new boarding school in the Isles of Skye. The young girl had accidentally left her book behind, and the professor picked it up meaning to send it on to her. But then he looked inside and discovered it was no ordinary book. It was a school textbook on magic. Could it be real? Could it have actually been left by accident and found by chance? Or was it all an elaborate hoax played on the unsuspecting professor? Did he ever find the secret Isles of Skye School of Magick? Did he ever discover the hidden world of wizards and witches implied by the book’s very existence? Or did they find him? The professor vanished soon afterwards, and the answers are unknown. Read the book and decide for yourself. Magical Wands: A Cornucopia of Wand Lore is that textbook from The Isles of Skye School of Magick. The first chapter begins with a basic overview of magic wands followed by an introduction to magical theory including the four planes of existence (Astral, Spectral, Physical, and Daemonic), the five metaphysical elementals (Quintessence, Air, Fire, Earth, and Water), and the three preternatural phases of Light, Twilight, and Darkness. It also contains sets of the commonly used spells associated with each of these elementals and phases. The first chapter then describes the different types of wands, their components, how they are crafted, and how they are used to cast spells. Chapter two teaches the 17 principles of wand making. Chapters three through six comprehensively cover the materials used to make magic wands including magical creatures (both beings and beasts), magical woods, mystical crystals, and mystical metals. Chapter seven documents 26 famous and infamous witches and wizards, their wands, and how well their wands suited their needs. Chapter eight concludes the textbook by nicely summarizing the contents of the entire textbook. Each of the chapters ends with student exercises, the answers of which are included in the back of the textbook which also includes a glossary, references, and afterword by the editor. If you have ever wondered what young witches and wizards actually study in their hidden magic schools, then this book is for you. When I read the first Harry Potter book (and especially when I watched the first Harry Potter movie), I remember that I was impressed by the Flourish and Blotts bookstore. The same with the Hogwarts library. I wanted to read such books. Not short little childrens’ books on magic but actual thick textbooks as in the movie. I remember thinking that I hoped that JK Rowling would write a couple such books. But when she did, they turned out to be thin little books she wrote for charity. Although I, like countless others, was tempted to buy prop wands from the movie, I was turned off by the fact that they were made of molded resin. I also didn’t like the idea that I would merely have a copy of someone else’s wand and that I would share that copy with tens of thousands of other Harry Potter fans. Finally, I thought that the designs were for the most part too simple, the vast majority being made from nothing but “wood”. I’ve always liked gemstones. So after many years during which no such books appeared, I decided to write one of my own. What better way of doing it could there be of becoming a wand maker, handcrafting wands from magical woods and mystical gemstones, and then writing a book on wand lore? 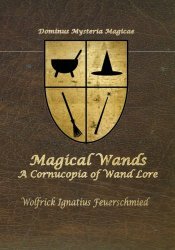 Thus was born Magical Wands: A Cornucopia of Wand Lore. In order for it to be a sizeable textbook of the type seen in the movie, it needed to be large. This is the source of the subtitle because of the fact that the manuscript grew and grew. I wanted it to be realistic as I could make it so I structured it as a textbook with exercises. I also kept it consistent as I could with both facts (e.g., characteristics of woods, gemstones, and metals) as well as traditional beliefs (e.g., a logical and consistent underlying magical theory based on sympathetic magic and the magical properties of magical properties of woods and gemstones). One key thing to remember is that this is a magic textbook. As such, some parts of it are akin to reference material rather than a fantasy novel. On the other hand, some of the other parts (e.g, the backstory and especially the wands of famous wizards and witches) are light reading. By the way, an interesting little exercise is to guess which of these mages are historical figures (mythology and actual people) and which are made up from whole cloth. Anyway, it is not your typical book, and some people love it while others hate it. Me, I’m in the first group, and I use it in my wand making. Each unique hand-crafted wand is made strictly in accordance with the book. You might want to buy a wand when you buy the book. Visit my shoppe at Firesmith’s Wand Shoppe.